With one foot rooted in jazz tradition, the other explores the present with an eye on the future. Saxophonist B.J. 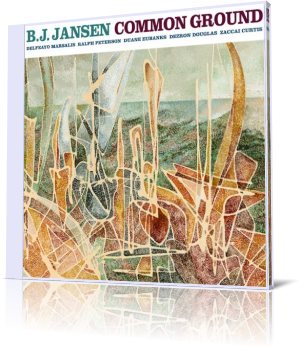 Jansen brings in five associates whose diverse backgrounds and musical styles culminate in the artist’s 10th recording as a leader, Common Ground (2017). Jansen plays baritone sax. His accompanists are Delfeayor Marsalis, trombone; Ralph Peterson, drums; Duane Eubanks, trumpet; Dezron Douglas, bass; and Zaccai Curtis, piano. “Street Walk,” composed by Frank Stagnitta, was inspired by the writer’s experience in New York City. The song has a beat the draws from African rhythms. The horn players are the driving force behind this piece, harmonizing for the main theme, then splitting into a series of solos. Douglas also gets a moment to stretch out, accompanied only by Peterson, who tears it up on the kit. “Brandon’s Blues,” a song Jansen wrote for his brother, Brandon, is revisited here and dedicated to all “brothers from another mother.” Marsalis is featured on this soulful track. Marsalis and Eubanks sit out the title song. This group effort was composed by the four musicians who perform it. Jansen opens with a dark, brooding solo. When the others come in, the song shifts to high gear. The baritone emotes, exploring its range both high and low. Jansen, 36, took a hands-off approach to the two-day session. Rather than dictate how he wanted the music played, he allowed the musicians to find their own grooves. The result is a comfortable balance between unit cohesion and jam session.